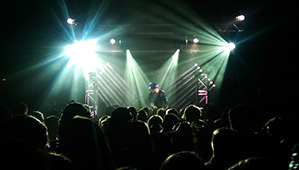 Whether you are just looking to rent a couple sound active lights for your social or looking for an awesome light show for a massive dance party, we've got the equipment that will make your event epic! 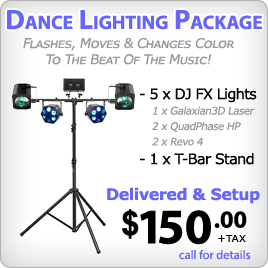 The following are a list of some of the types of dance lighting fixtures we carry. 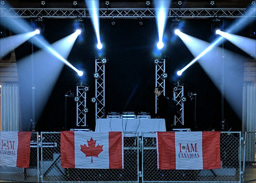 Sound Active FX Lights, Lasers, Black Lights, Strobe Lights, Mirror Balls (disco ball), Stage Wash Lights, Pin Spots, Intelligent Moving Lights, Truss Totems with Covers, Haze Machines, Fog Machines, CO2 Cannon Effect (Geyser/Fog Furry Jet), Spot Lights & More! 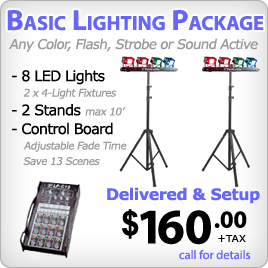 All of our lighting packages & rentals include delivery & setup.